This guide is an introduction on how to get the best value from casino games, including how to lower variance. When using casino offers in matched betting, it's important to keep risks as low as possible. Members can access a full, in-depth guide to casino games and how to lower variance, including video tutorials. The guide includes how to play and get the best value from casino games, including roulette, french roulette, blackjack and online slots. 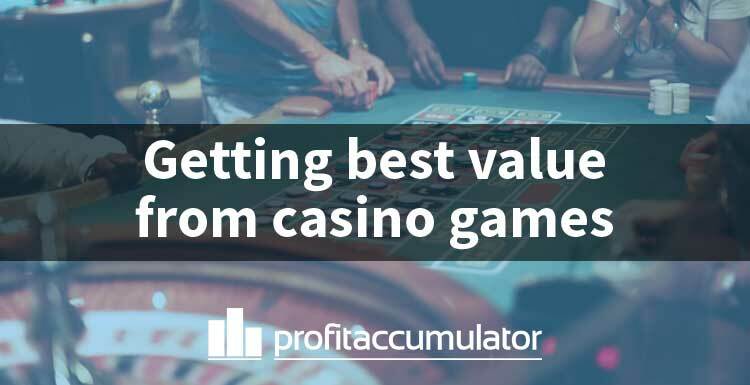 It also covers casino strategy, explains how to lower variance and how to find estimate expected value (EV). Roulette is probably the most famous casino game and one you will find yourself playing plenty of when getting offers from the bookmakers. It is an incredibly simple game in the fact that, unlike Blackjack, you have no decisions to make apart from how much you want to bet and what you want to bet on. Betting on 1 number – 35 to 1 (a £10 bet will give a £350 profit). The RTP (return to player) of standard Roulette is 97.3%. You can also read more about RTP below. French Roulette is almost identical to normal Roulette, except for one small rule which halves the house edge. This rule is called "La Partage" and it means you only lose half your stake when the ball lands on 0 if you placed an even money bet. Because of this, the best strategy long term when playing French Roulette is to place all bets on even money selections such as Red or Black. The RTP of French Roulette is 98.65%. If you ever have the choice of playing Roulette or French Roulette, always pick French Roulette because of the higher payout. Blackjack is a slightly more complicated game than Roulette, but it has a very low house edge so makes it great for casino bonuses (provided it is an eligible game). The exact rules will vary from casino to casino but the general way the game works will remain the same. Before we start, it's important to know that every card in Blackjack has a value; Cards 2-10 count as their face value, all face cards (Jack, Queen, King) count as 10 and an ace can count as either 1 or 11 (whichever suits you best). Hit – Take another card. If you don't go bust you will have the option to do everything from this list again. Stand – Stop and take no more cards. It will then be the dealer's turn. Double – Your stake is doubled and you are dealt one card and one card only. After that you are forced to Stand. Split – If you have two identical cards (eg. 2 fours) then you can split your current hand in to two separate hands and start again. Your stake will be doubled as you now have two hands instead of one. Surrender – This is isn't an option often offered but you will occasionally come across it. If you have a particularly bad hand, and the dealer has a good card, you can choose to surrender your hand. You will instantly lose the hand but only lose half your stake. This may all sound quite complicated but we have put together a guide here which always gives the best possible strategy for every possible hand. After you've made your decisions, the dealer will draw cards until either they have a total of 17 or higher, at which point they stop, or until they go bust. If you have a higher total than the dealer then you will be paid even money (a £10 bet will give a £10 profit). If you are dealt a total of 21 in your first two cards (eg. an Ace and a King), then you will be paid at odds of 3 to 2 (a £10 bet will give a profit of £15) unless the dealer also has 21 with two cards. This particular hand is known as "blackjack" and it beats everything apart from another blackjack. The RTP of Blackjack changes depending on specific rules, but it is usually around 99.5%. As well as having an incredibly low house edge, it is also a very low variance game. Slot machines are probably the most common game we will be playing with bonus funds from casinos. Slots come in all shapes and sizes; there is an astounding array of different payout structures, graphics, gameplay, bet sizes, bonus rounds and everything in between. There is very rarely any strategy when playing slots, it is a case of setting your stake and then pressing the spin button. After doing so, the reels will spin and the game will tell you if you've won and how much you've won. Regardless of what happens visually on the slot machine, the picking decisions it may make you choose, the amount you've won in the past, every single spin is independent. 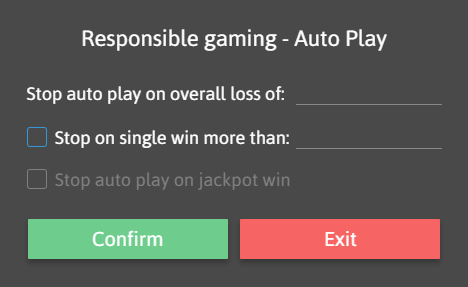 This means that the slot has no memory, it doesn't know if you've been on a winning streak or a losing streak, it just randomly generates a payout for you with each click of the spin button. 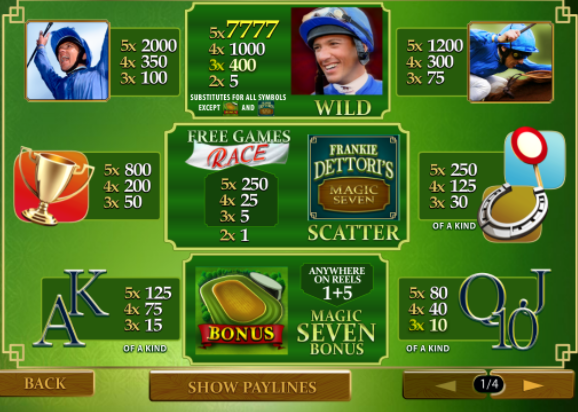 Win Lines – Most slots have an option to change how many lines you play with. Win lines go from left to right across the slot reels and matching symbols on one of those lines will give a win. The more lines you have the more possible combinations will give you a win. We always recommend to play with maximum lines as it means per spin you win more often, and thus are lowering the variance/volitality. Coin Value/Bet Level – Some slots won't just have a single button to change how much you are betting per spin, they will have a coin value and a bet level. Coin value is how much you are betting per line and bet level is the amount of coins you are playing per line. This is just a fancy way of changing the stake size and you can just adjust both of these to give you the overall stake you want. Coin Value/Bet Level aren't important, it's your total bet size that is. Paytable – You can find the payout of a slot and how much it pays for each symbol usually by clicking on a Paytable/Info/Help button. Autoplay – Instead of manually clicking spin each time, a lot of slots will give you the option to automatically spin a certain amount of times for you. You can do this by finding the Autoplay button and selecting an amount of spins. You will also then need to set a maximum loss for that round of spins. Autoplay can be very useful when doing offers with large wagering that require many slot spins. Bonuses for casino offers can often have wagering attached to them, or you need to complete wagering to get a bonus, or both. Wagering isn't how much money we have to lose, it's simply how much we need to play through. For example 100 x £1 slot spins would be £100 wagering. Sometimes wagering is given as a monetary amount (eg. wager £100), sometimes it is given as a multiplier (eg. the £5 bonus must be wagered ten times). In this scenario we multiply the bonus amount by the wagering requirement to get the total amount that needs playing through. Here it is £5 x 10 = £50. At times you will be required to wager just the bonus, other times there will be wagering requirements on both your deposit and the bonus given to you by the casino. In general, the higher the wagering, the less profit we will make from an offer. Most of the time the best games to use for wagering are ones with a high RTP and low variance. Every casino game will have an RTP (Return to Player) which is displayed as a percentage. It is the theoretical percentage of wagered money that will be paid back out to the player over time. For example, we have a slot with an RTP of 95%. This means that in the long run, for every £100 that you play through the game, you will receive £95 back (95% of £100 is £95). From this you can clearly see that the higher the RTP, the more money that will be paid back out to us on average. High RTP games are ideal when making money from casino offers. Since the RTP is assuming an infinite amount of spins (slot machines are tested with billions of spins), you aren't always guaranteed to get exactly the RTP amount back from your wagering. This is because of something called variance. In mathematics, variance is basically a score of how far away your results can be from the average result. In essence, for slots and casino games, it's a word used to describe how much the payout from each spin can vary. Low variance – When a game gives you small wins frequently. Playing a low variance game tends to mean you won't lose too much or win too much either. High variance – When a game gives you large wins but relatively infrequently. Playing a high variance game tends to mean you will either win a lot very quickly, or lose a lot very quickly. Often, we want to play low variance games/strategies so that we don't lose too much when wagering to get a bonus or free bet. We play Roulette and put £1 of our money on Red. Here we have a 18/37 (48.6%) chance to win, so you can see we should never really win much or lose much as we play more and more £1 spins. This is because we're playing with a low amount of money and have a relatively high chance to win. This is an example of low variance. Now let's say we change our strategy and put £100 of our money on a single number. Here we have a 1/37 (2.7%) chance to win so you can see now we will either win a lot, or lose a lot very quickly. This is because we're now playing with a larger amount of money and have a low chance of winning. Our reward, however, is higher should we get lucky and win. This is an example of high variance. How to lower variance – Lower stake size, increase probability of winning (eg. increase number of lines on a slot or numbers covered on Roulette). You will often see the term EV used on Profit Accumulator, this stands for Expected Value or Estimated Value. This isn't the value we expect to get every time, but instead the value we expect to get on average if we did an offer an infinite amount of times. If an offer has a positive expected value (+EV), we have the edge and it is worth doing. If it has a negative expected value (-EV), then you will lose money in the long run. The larger the EV, the more money you're likely to make. Profit Accumulator will always work out the value of the offers for you, but it's nice to know where the numbers are coming from. EV = [(Probability event 1) x (Profit/Loss if event 1 happens)] + [(Probability event 2) x (Profit/Loss if event 2 happens)] + [(Probability event 3) x (Profit/Loss if event 3 happens)] + etc. Game – A coin is tossed. If the result is heads, we win £10, if the result is tails we lose £5. Probability of heads = 50% or 0.5, probability of tails = 50% or 0.5. EV = (0.5 x £10) + (0.5 x -£5) = £5 - £2.50 = £2.50 – Since this is positive we have a +EV game. If we played this game an infinite amount of times we would expect to make on average £2.50 each time we play it. RTP is the return to player, so the house edge is the return taken away from us. In other words, the house edge is 100% - RTP. Then we turn the percentage into a decimal to use in our calculations by dividing it by 100. For example, 5% becomes 0.05. Example: Wager £20 on a slot with 95% RTP, get £5 cash. EV = £5 – (5% x £20) = £5 – (0.05 x £20) = £5 - £1 = £4. So we expect to make £4 profit on average from this offer. Now let's do the same offer but playing a game with a lower RTP of 60%. EV = £5 – (40% x £20) = £5 - £8 = -£3. We can see now we have a negative EV – in the long run we expect to lose money from this offer. It is evident from this that a high RTP game delivers better long term results. Sometimes our reward/bonus won't just be cash, it will itself need wagering. To work out the value of the bonus after wagering use the same formula as above to find its real value. Value = Bonus - [House Edge x Wagering]. Calculating EV is all about finding out the true value of the bonuses we are given, and the loss we will incur to get it. It is important to remember that EV is all about the long term, if you take every EV offer you can, you may well lose money on individual offers, but in the long run you will profit. The more offers you do, the more likely you are to reach the true EV. If you want to read more about EV and working out the value of offers then read this article in the training section.